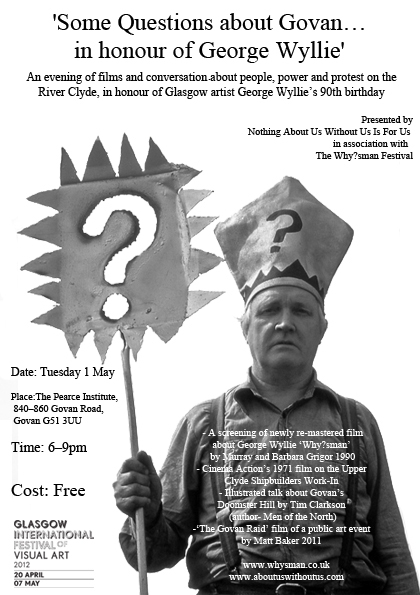 An evening of films and conversation about people, power and protest on the River Clyde, in honour of Glasgow artist George Wyllie’s 90th birthday. In a career spanning over 40 years, George Wyllie has made some of his most celebrated works on and around the Clyde, including the Straw Locomotive and the Paper Boat. Highlights of the evening will include a screening of newly re-mastered film ‘Wys?man’ by Murray Grigor (on George Wyllie), an historical talk about Doomster Hill (the ancient moot hill of the Kingdom of Strathclyde), Cinema Action’s 1971 film on the Upper Clyde Shipbuilders Work-In, and a 7 minute film documenting ‘The Govan Raid,’ a 2011 public art event by Matt Baker. Booking information: No booking is required, but seating is limited – please come early to avoid disappointment.